All honours to Winx in a fitting farewell on Day 2 of The Championships but what about the Japanese visitor Kluger! Few horses have been able to go with the champ, especially over 2000m, but Kluger produced a career high in running second in the Queen Elizabeth Stakes and it’ll be interesting to see if he can continue back home, and perhaps return in 2020. Punter’s Intelligence data recorded Winx’s final 600m in 33.82 but Kluger was only 0.14 slower than her overall for that section. 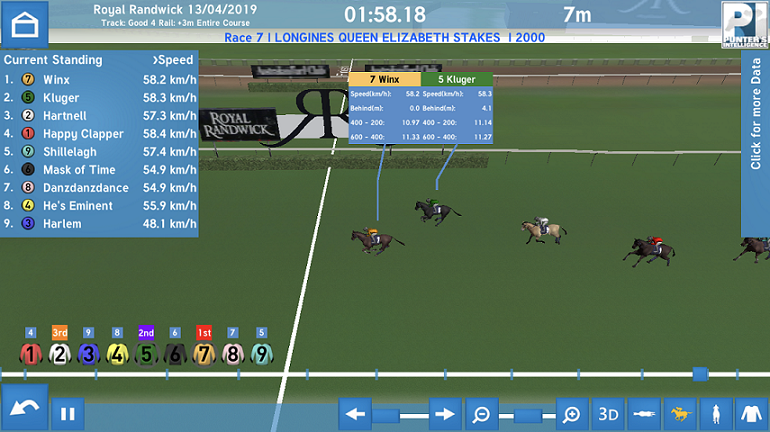 Kluger’s 600m-400m was a race best 11.27 (Winx 11.33) but Winx was able to put the race away with a sizzling 10.97 from the 400m-200m (Kluger 11.14) and 11.52 (11.55) home. They were together coming to the turn, Winx circled and Kluger gained an inside run, but respect to the raider who refused to give up the fight. With Winx now retired there’s plenty of horses we can follow through the autumn and put in the bank until the spring. Foxborough’s narrow defeat in the opening race over 1600m, at just her second start, suggests she’s a filly with plenty of talent. She produced the fastest 200m splits from the 800m with a final 600m in 34.13, more than half a second quicker than any other runner, and she produced a 10.96 from the 400m-200m. Trainer John Sargent didn't nominate for the Group 1 Champagne Stakes (1600m) on Saturday so keep an eye out for her next step. It’s hard to take anything away from Bobbing’s win in the Polytrack Provincial Championships Final (1400m) but there could be a case of what might have been for Fuchu. The Kim Waugh-trained gelding was some 30m off the lead midrace after getting well back from the outside alley and that may well be what cost him the race, given he clocked 34.60 for the last 600m to be beaten one length. Perhaps the effort to play catch up told on him as he could only match Bobbing’s last 200m of 11.98 after being superior from the 600m-400m. But there are more wins in store for him. The Arrowfield Sprint (1200m) looked a strong race on paper and should turn out that way with Classique Legend living up to the early boom. He ran 33.58 for his last 600m and he put the race away from the 400m-200m running 10.75. There’s been Everest talk around the gelding but there’s also The Golden Eagle if he can stretch to 1500m. Don’t jump off Trope despite his midfield finish, he was clearly the second fastest 600m (33.79) and was still attacking the line at the finish with 11.78 the fastest last 200m. He gave some very good horses too much start but that was only his third appearance so he’s all upside. The South Pacific Classic was another strong three-year-old race and away from the obvious unlucky Millard Reaction (fastest last 200m 11.90) the runs of Gem Song and Napoleon Solo are worth noting. Gem Song has had an interrupted autumn preparation but he produced the best last 600m of 35.17 as he motored home from well off them and if he’s back on track there’s win at Hawkesbury or Scone for him. Napoleon Solo was first-up and made his run along the inside, his last 600m of 35.36 was second only to Gem Song and suggests he’s in for a nice campaign. A note about Nakeeta Jane, who ran eighth in the Group 1 Coolmore Legacy, she was set a big task from the outside alley and conceded a decent start but clocked 33.72 for her last 600m. Look forward to seeing what she can do next time in. Fastest last 600m: Spright 32.88. Most ground covered (to win): Verry Elleegant +18m. Don’t miss Punter’s Intelligence with Gerard Middleton, Brad Davidson and Brad Gray at 7pm on Tuesday on Sky Thoroughbred Central.